Is The Korat Cat Good For You? 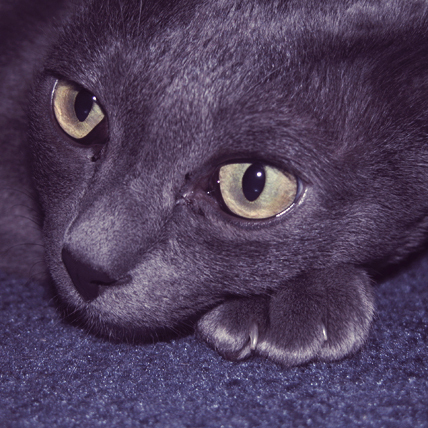 The Korat cat is a great cat for an enthusiastic pet parent because they love to be around you. Korats are very energetic and love to watch people and mimic them. The Korat has a unique look and a fur color that's described differently by almost every person who sees one. One of the ancient “17 good luck cats” of Thailand, dating back some 500 years, this breed is also known as the "si-sawat" and is a harbinger of good fortune, making them commonplace wedding gifts. They were first introduced to Europe in the late 19th century. Lovingly called “the silver-blue cat with the Thai passport,” Korats have been bringing good luck to families for years. Korats have an average sized, semi-cobby body, with a slight tapering around the waist. They have well built, sturdy, muscular bodies. Their heart-shaped head and large green eyes give them an irresistibly cute look. Their tail is moderately long, and can sometimes have a slight kink at the tip, which indicated extra luck in Thailand. Korats are willful and sure-footed cats that know what they like and dislike, and are not afraid to let you know. They make great companions, as they form lifelong bonds quickly; however, they can be somewhat selective in whom they choose to ally themselves with. They are quite communicative and also easily trainable, faithful, smart, and loving. They do well in a wide array of environments, and tend to be pack leaders when in a situation with multiple cats. Training a Korat takes a firm hand, but it can be done. The Korat only ever has a single layered blue coat with a silver tipping.